Tuesday April 10th 1894 It was a cold windy day. I did my work and practiced some on the piano. The men were at work on the field on the east side of the road. I pout out the pie plant Mother gave me just before eight. I read all the evening. 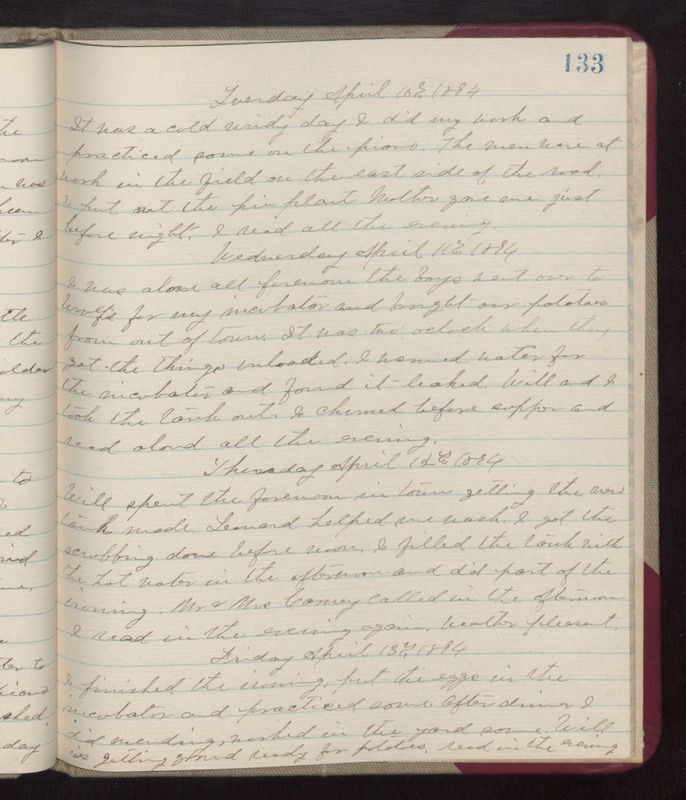 Wednesday April 11th 1894 I was alone all forenoon. the boys went over to Woolfs for my incubator and brought our potatoes from out of town. It was two oclock when the got the things unloaded. I warmed water for the incubator and found it leaked. Will and I took the tank out. I churned before supper and read aloud all the evening. Thursday April 12th 1894 Will spent the forenoon in town getting the new tank made. Leonard helped me wash. I got the scrubbing done before noon. I filled the tank with the hot water in the afternoon and did part of the ironing. Mr & Mrs Carney called in the afternoon. I read in the evening again. weather pleasant. Friday April 13th 1894 I finished the ironing put the eggs in the incubator and practiced some. After dinner I did mending, worked in the yard some. Will is getting ground ready for potatoes. read in the evening.